This article is a translation and expansion of the article that appeared in Historische Bürowelt 102 (C. Vande Velde, HBW (2015) Nr. 102, pp. 3-5). In 2011, I wrote an article on the “Mysterious Brunsviga PJ”, which is a machine that was featured only in two advertisements, including variously retouched illustrations trying to make the point that it had long setting levers along the lines of the Brunsviga J, but no thumb button next to the crank to free them with for setting the numbers. A single machine of this design proved to be in existence in 2009, with serial N°18751, which dates it to approximately 1911. This was much earlier than the Brunsviga PJ16 was supposed to have been constructed - according to the records, the PJ16 was presented to the Board of directors in 1916 (this is also the reason for the 16 in the name, just like the Brunsviga M24, which was brought out in 1924). It was advertised in 1916 and 1918. This particular large size machine, N° 18751, had no thumb button to free the setting levers, and its probable principle of operation was illustrated in my previous article, already mentioned higher. I will further expand on it in the second part of this paper, below. 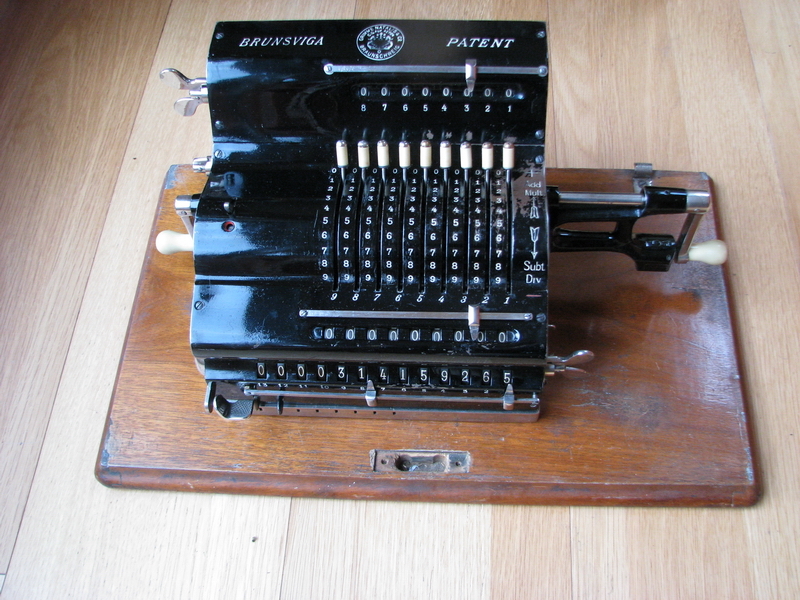 I also discussed in the 2011 article whether perhaps this machine N° 18751 would be a prototype, or a later machine with an earlier serial number, a practice which Brunsviga has been known to use for prototypes. In the mean time, this debate has been settled, as four more of these machines have come to light, all of them large models, one with serial N° 18590, one with serial N° 14158, one complete Arithmotyp (N° 209 –impossible to date so far) and one incomplete Arithmotyp with N° 32307, of which the printing mechanism was either removed, or never assembled in the first place. This last machine, according to the serial number, dates to … 1916, indicating at least a renewed interest in this mechanism at that time (perhaps the cylinder was being built into an incomplete Arithmotyp frame for testing purposes, as the regular Brunsviga J was no longer in the model range by 1916, whereas the Arithmotyp was still being made). The fact that three identical contemporary J–like machines exist, with several known regular Brunsviga J’s in between, proves that they are not prototypes, but were part of the regular range that was for sale. From aspects in their appearance, and comparison with regular J machines, they do in fact all appear to have been made in 1910-1911 and not later. So far, nothing has been found about this particular type of machine in the literature, either in Grimme, Natalis & Co advertisements, documentation from the factory, or the patent literature. This factory documentation, which will be discussed in a little more detail here, consists of two typed lists of machines. 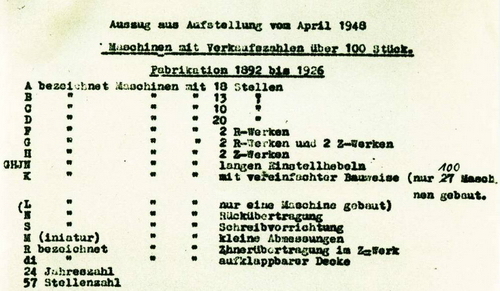 Dr. Ernst Eberhard Wilberg’s list, dating back to 1951, is titled “Auszug aus Aufstellung von April 1948” – extract from the April 1948 line-up. This list appears to be the abbreviated summary of another list typed up by Dipl-Ing. Richard Haase in 1948, which is at least 35-40 years after the period we are interested in. Both lists quite conveniently give all known Brunsviga models, with the Haase list attempting to give a summary of all of the Brunsviga machines ever made, including prototypes and series of 1, while the Wilberg list only lists those machines built in numbers larger than 100. 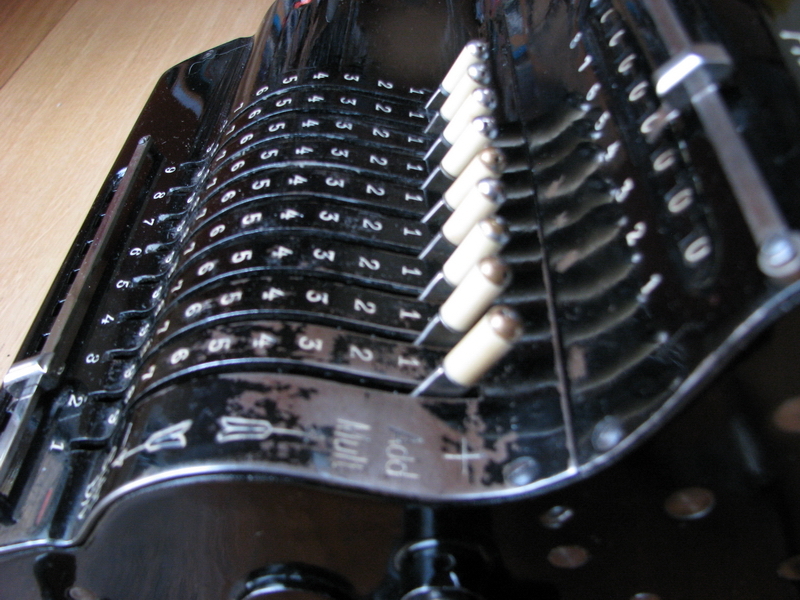 There are now two possible theories about the “Brunsviga J without the thumb button”. The first theory is that the Brunsviga factory was experimenting with a new way of implementing fixed setting levers, and they slipped the occasional machine into the regular model line, without giving it a new model designation. In that case, these machines are just a simple variant of the Brunsviga J, in the same way that Brunsviga experimented with the clearing mechanism for the carriage and the tabulating carriage shift – these machines too are Brunsviga J’s, without any new model designation. If this is the case, their number falls into the known total of Brunsviga J’s built (2997) from Wilberg’s and Haase’s lists, and we will never know how many of these “special” machines without the thumb button were built. There is however also the possibility of an oversight or misinterpretation in the two lists, which to my knowledge has not been considered so far. If these machines had their own model designation, then logically, it must occur in the lists. Admittedly, both lists are sloppy pieces of work, and in the copying process from one to the other, numerous errors were made. It is unknown what the source material for Haase’s list may have been, and whether there are any Brunsviga models that he missed completely, because they were missing from his own source material as well. In any case, in both lists, at the end of the section on the machines with long setting levers, we find an intriguing entry reading “K (bezeichnet Maschinen mit) mit vereinfachter Bauweise (nur 27 100 Maschinen gebaut. )” , which translates to "K (signifies machines with) simplified construction (only 27/100 machines built)". 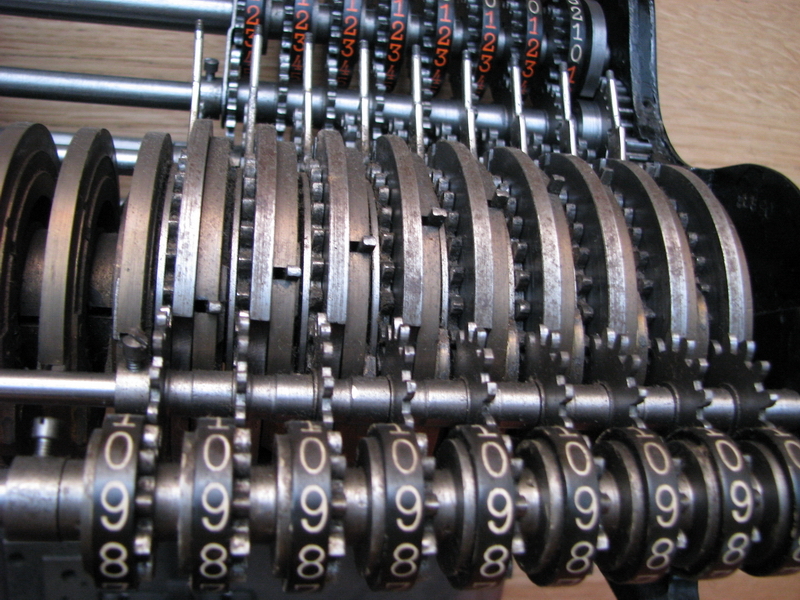 The 27 is scratched out and replaced with 100 by hand in Wilberg’s list, the Haase list just gives the number of machines as 27, without any corrections. 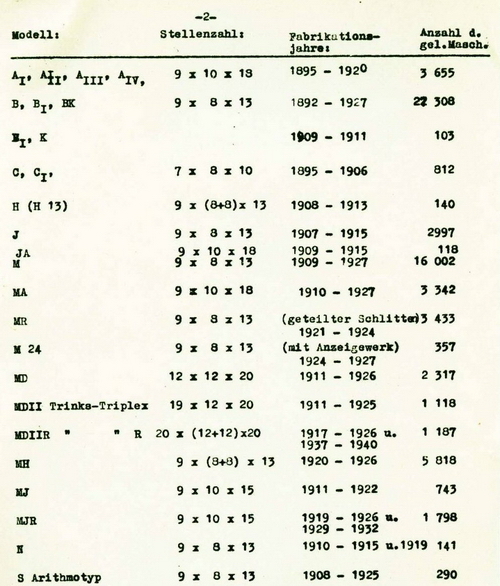 The detailed model list that accompanies these lists, with register sizes, build periods and number of machines built, differs in its record of the Brunsviga K. Haase’s list has two entries – one for the B, BI, and BK, with 27308 machines built, and on the next line a machine designated BI K, with a smudge in between indicating a correction, and 103 or 108 machines built. In Wilberg’s list, however, this latter line has transformed to “BI , K”, with a comma in between, and is now showing 103 machines built. (The odd-looking B is a typo - the typist hit "V" first and corrected). This appears to be an error in the copying, as it would make much more sense not to repeat the same machine on a different line. What the actual difference is between the Brunsviga B, BI , BK and BIK, and whether any of these last two machines are actually known, is still quite unclear. That is the extent of the information on Wilberg’s list, which supposedly only discusses machines with more than 100 examples built. But on Haase’s list, there is another entry, reading just “Brunsviga K”, which was supposedly built between 1915 and 1916, with a total number built of 27 machines. No register capacities are listed for this “K” machine – either it has the same register capacity as the machine above (JA), but this convention is used nowhere else on the list, or the author of the document simply did not know, and could not find out, as apparently none of these machines was retained at the factory museum, and no-one was around who could remember the correct register capacities. No-one, to the best of my knowledge, has ever seen one of these Brunsviga K’s, or knows what it would look like. This leads to the second theory, which is simply that the machines under scrutiny here, with long setting levers but without the thumb button, are actually this very "Brunsviga K" that has been missing so far. It is strange that the last line about the Brunsviga K should contain two “with”s – and this grammatical oddity is consistent in both documents. Perhaps what Haase really meant to say was “K indicates machines with long setting levers with simplified construction”, but did not have the space to type all of this and therefore abbreviated it. “Machines with long setting levers with simplified construction” happens to be an exact description of what these five machines without thumb button at the crank in fact are – machines with long setting levers, and a simplified construction, doing away with the complicated safeties , the additional push-button and the release for it. On the other hand, sceptics may say that the mechanism of the pinwheel cylinder itself can hardly be called “simplified”. They are perhaps machines with “simplified operation”, but not exactly of “simplified construction”. 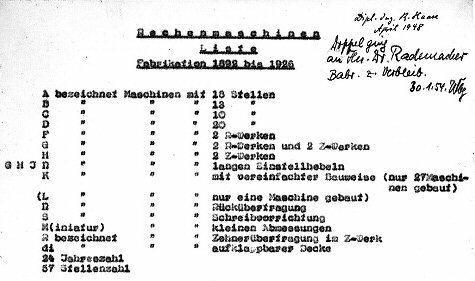 Wilberg then may have misinterpreted this as “this Brunsviga K next to the B range of machines should mean simplified construction, and it features again lower in the list – so they must be the same machines, and the number built must be 103 (or 108, Haase’s typewriter font is rather unclear) as well – so we will scratch this 27 and replace it by 100”. An alternative explanation is that Wilberg found out somehow (new source material other than Haase's list?) that instead of 27, 100 of these machines were built, and not just in 1915-1916, but also in 1910-1911, which is consistent with the machines that have now been found – three from 1910-1911, an Arithmotyp from 1916, and another Arithmotyp of unknown vintage. Theory number 2 would imply that the “Brunsviga J without the thumb button” is really a “Brunsviga K”, and the fact that only 27 (or 100) machines were built in series with the Brunsviga J explains why they are so rare today – in total, according to the same document, 2997 regular Brunsviga J’s were built, plus 118 JA’s, 743 MJ’s and 1798 MJRs. It may then be that 27 machines were built in 1915-1916, but the largest number (around 73) actually date from between 1909-1911, and Wilberg ran into a record of these in the source documents for the list at a later time, explaining the hand-written correction, and the inclusion of the K in the list of machines with over 100 machines built. The infamous PJ16 from the advertisements, as “presented to the board of directors in 1916”, could then be either the (planned) miniature sister of this simplified machine, or a reworked version of the earlier K – from the advertising engravings for the PJ16, it is clear that either a big machine is shown, with the big version of the long setting levers, or it could be a miniature machine, in which case it would have the small version of the long setting levers. From the 3 known 1910-1911 machines, however, it can be seen that all of these (in contrast with regular J’s) have the smaller setting levers on a big machine. The two (later) Arithmotyps known with the same mechanism, both have the long setting levers, so the PJ16 as a planned reissue of the older K remains a possibility as well. Whether conclusions can really be drawn from the advertising engravings, which were being doctored rather freely and at will, also remains a question. If the PJ16 was really a planned reissue, the reason for changing the name from “K” to “PJ16” would then have to do with the new nomenclature Brunsviga was trying to introduce, with 16 standing for the year, as it would in the 1924 M24, and P for “Parva” as in the post-1927 machines – here once again meaning, “simplified”! However, the engravings in both PJ16 advertisements show machines with an advanced tabulating carriage lock and a capacity of 15 in the result register, exactly like the MJ and MJR. This still seems to point to the fact that the Brunsviga PJ16 was really the planned miniature version of the Brunsviga K, advertised in 1916 and 1918, but of which no machines have been found to exist so far. In that case, the question rises then why it wasn’t advertised as the MPJ16. That whole issue may be entirely academic, as the PJ16 does not appear in Haase’s list, so maybe plans and advertisements are all that has ever materialized, and after the presentation (of the plans, not of the machine!) to the Board of Directors, they were shelved without any machines actually having been constructed. In conclusion, either of these two theories has its attractive points, as well as its problems. In case of theory 1, it is very strange that Brunsviga did not allocate a new type designation to these machines – they were definitely built in series, in between regular Brunsviga J’s with the thumb button. There would have been a clear advantage in them for customers, and the build cost for these machines would have been higher too. Why not give them a new type designation to add prestige, and price them higher? In addition to this point, we are stuck with a Brunsviga model in Haase’s and Wilberg’s lists which no-one has ever seen, despite 100 examples allegedly having been built. Unless it is very similar to other types, and we simply do not know how to recognize them, this is almost inconceivable. 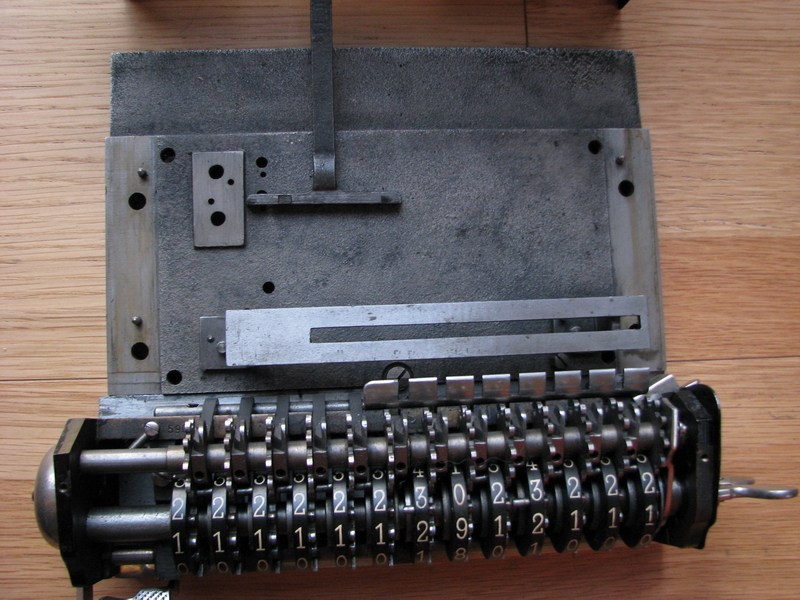 On the other hand, the same reasoning could be followed for the Arithmotyp-like machines … and there is no entry at all in Haase’s list for a Brunsviga SK or KS – whereas they did undergo the same treatment as the regular J’s, and also received the thumb-buttonless pinwheel cylinder. Perhaps Arithmotyps were considered to be so special already that a new type designation for these "specials" was deemed unnecessary. In case of theory 2, the main merit is that we can make a match between a machine in the list that no-one knows what it should look like, and a machine that we have in the metal, but that appears not to exist on paper. This solves two problems at once, and according to Occam’s razor, it is definitely the preferential solution. 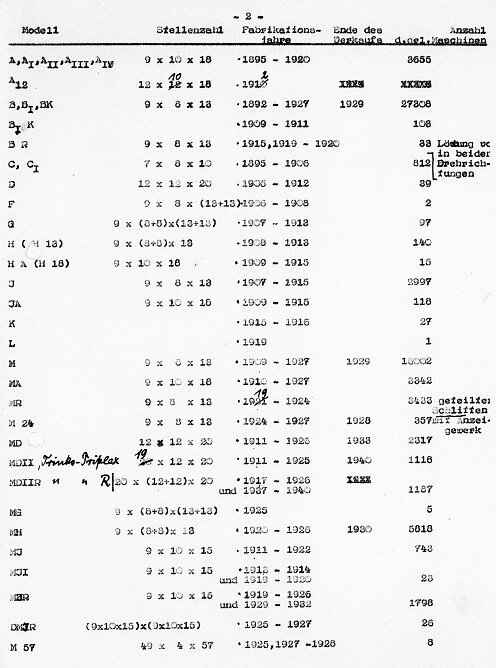 But then there is the matter of the “simplified construction” versus “simplified operation”, as well as Haase’s quoted build period (1915-1916) which does not fit with the machines that have been found until now – unless Haase did not have all the information available, and Wilberg was not merely confused between the BI, BIK and K, but had really found out that a substantial number of these machines had been built earlier than 1915. Let’s remember both Haase and Wilberg were practicing industrial archeology, trying to reconstruct events 40 years and two devastating wars ago. Wilberg did not, however, indicate the 1915-1916 build period at all anymore. Oversight, error or an actual correction? Before any decision can be made on which theory makes more sense, someone will have to come up with a Brunsviga that clearly shows “simplified construction”, or contemporary documentation has to surface which advertises a Brunsviga K as having fixed setting levers and being more expensive than a regular Brunsviga J. If anyone has anything like that lying around, please feel free to write in! Enough speculation and guesswork for now, in the second part of this article we will look at the differences between these machines and the “normal” Brunsviga J. We will designate the thumb-buttonless machines, for now, and for the duration of the rest of this paper, tentatively as the Brunsviga K. Now that I have one of these machines in my possession, I was also able to take it apart and verify its operating principles put forward in the article on the Brunsviga PJ16. The first difference is the setting levers – the Brunsviga J has setting levers 25mm high, whereas the ones in the Brunsviga K are shorter, at 16mm. Both Arithmotyps do have the 25mm setting levers. 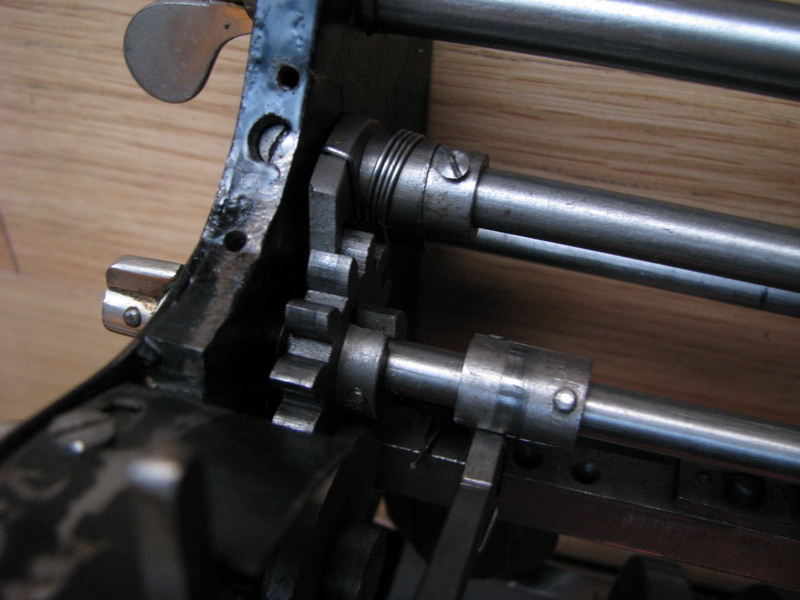 Secondly, obviously all the machinery associated with the crank and locks of the J machine is missing in the Brunsviga K. The holes in the crank support have been plugged with pieces of metal, and most of the holes in the housing of the machine have been plugged and painted over – the support for the cantilever on the left side has been removed as well. Thirdly, since this machinery also provides the locking functionality to prevent the setting register being cleared while the machine is in operation, another solution had to be found for this. 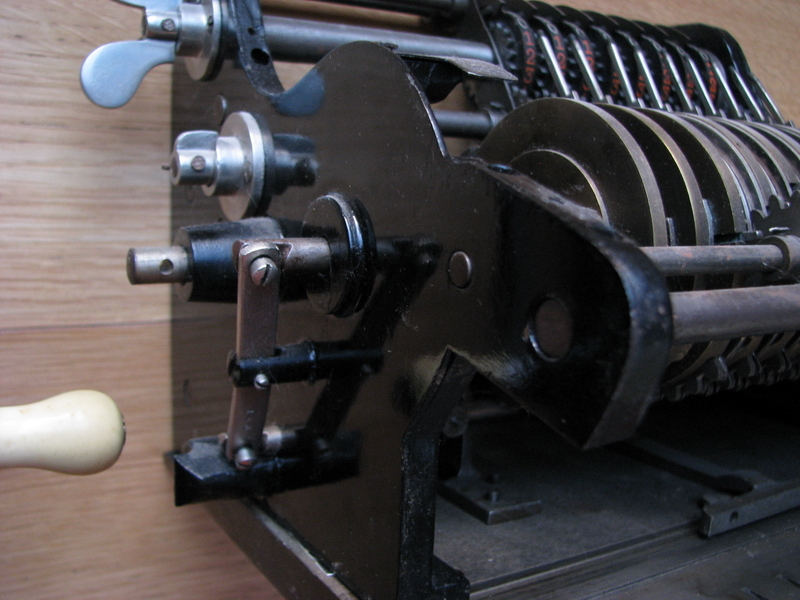 It now consists of a long arm with a pin, which falls into a hole in the pinwheel cylinder when the input clearing lever starts its turn, instead of a locking pin being shifted to the left into a locking disk (the disk is still present, but unused) due to the action of the thumb button and the associated bars and levers in the regular J machine. 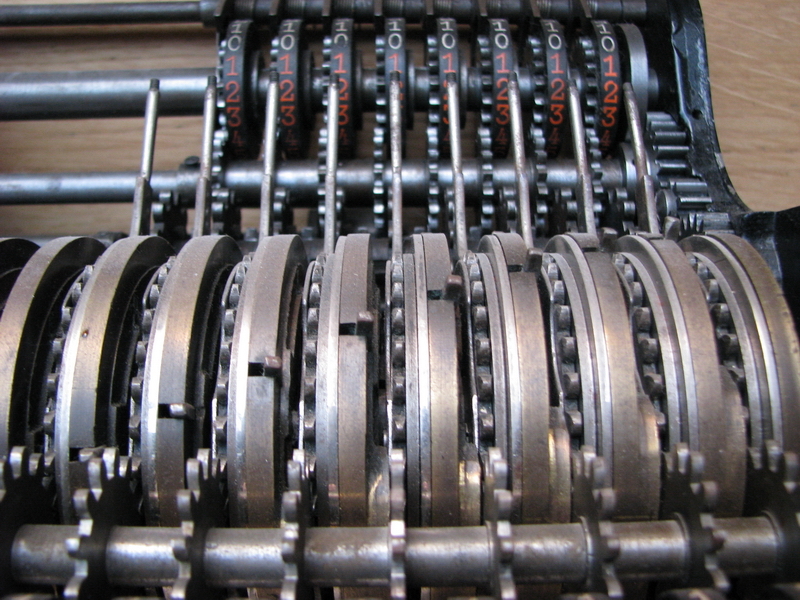 The lock in the Brunsviga K works in both directions – it prevents the clearing operation while the pinwheel cylinder isn’t in its resting position, because the pin cannot tilt downwards into the hole, and it also prevents the pinwheel cylinder from turning while a clearing operation is in progress. 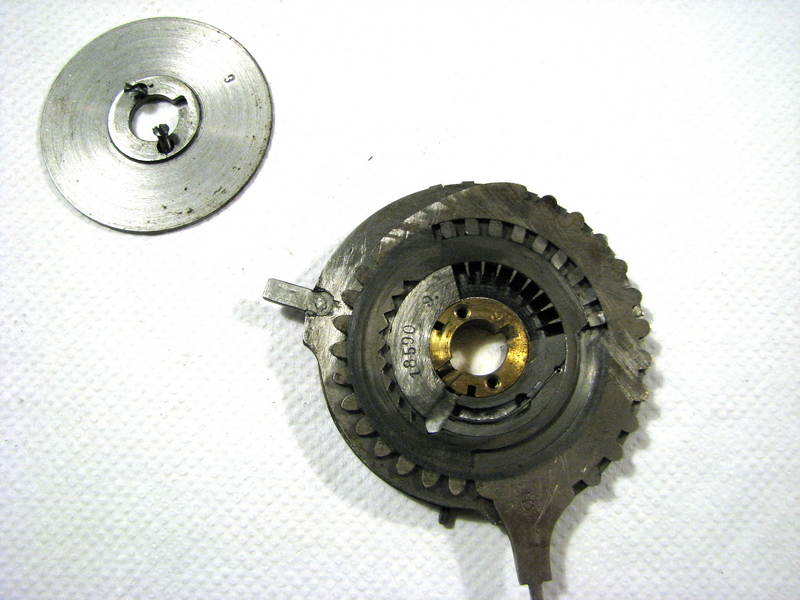 Another interesting difference is that the Brunsviga K has a provision for the input clearing crank not to turn clockwise – there is a ratchet and pawl, which means that a Brunsviga K can also easily be identified from the clicking sound the ratchet makes when clearing the input. 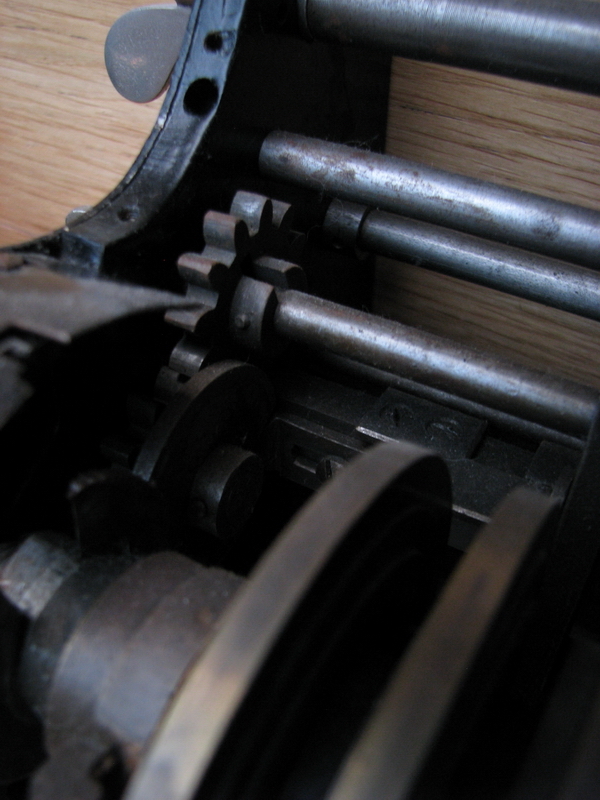 On a Brunsviga J the crank for clearing does not click on operation, and can simply be turned backwards as well as forwards. 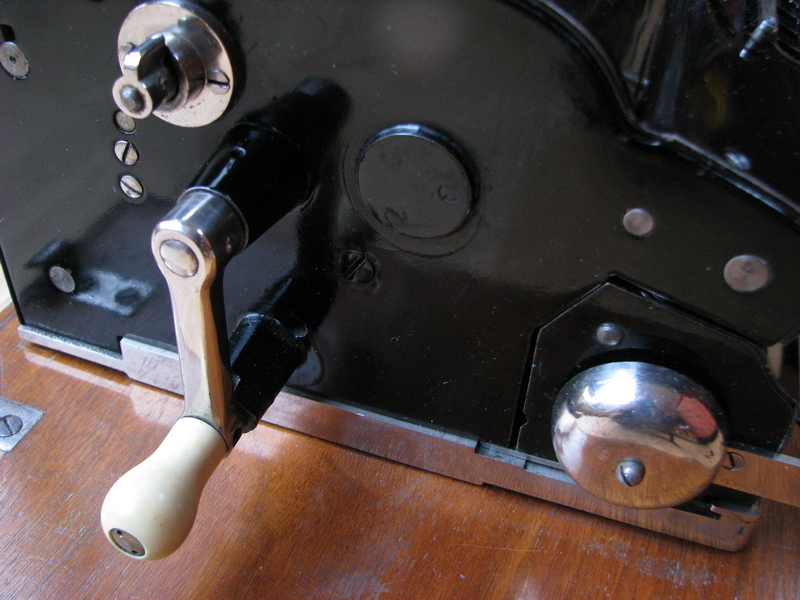 I could also speculate on the reason for this – in a Brunsviga J, it is much faster and more convenient, especially for the right-handed among us, to set the input register not by pushing the thumb button with your right hand, then setting the input levers, return your hand to the crank and fumble for the release button before starting the crank turn, but rather to clear the input with the crank on the left, and instead of resting it at the end of its turn, to continue turning for about 10 degrees – this also releases the input levers, so they can be set, and then the crank can be turned back, clockwise, and rested. This removes the need alltogether to use the cumbersome thumb button/release mechanism. 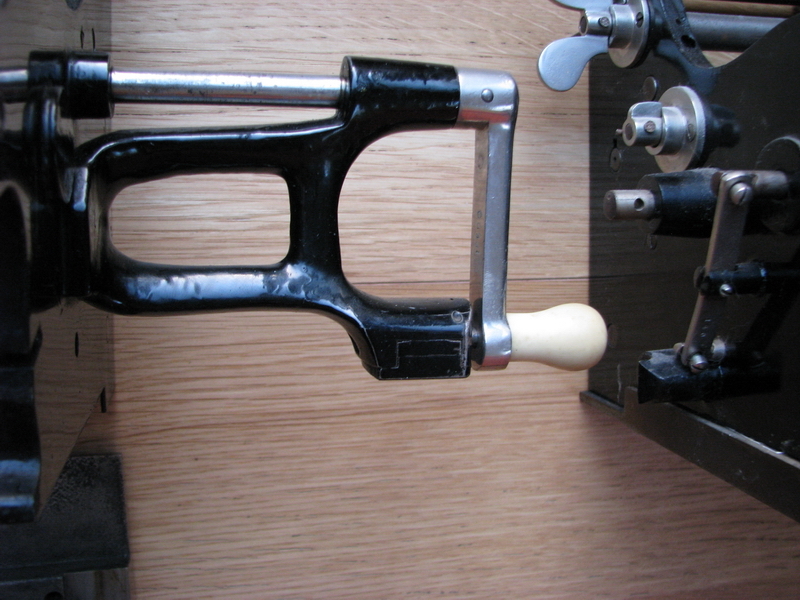 On the Brunsviga K, turning the clearing lever counterclockwise would be impossible, because of the ratchet. A conscious choice for an extra safety to prevent the input from only being cleared partly, at the cost of a few extra parts in the Brunsviga K ? Both Arithmotyps do not have the ratchet and gear, so they don’t “click” and the setting lever clearing can be turned backwards. 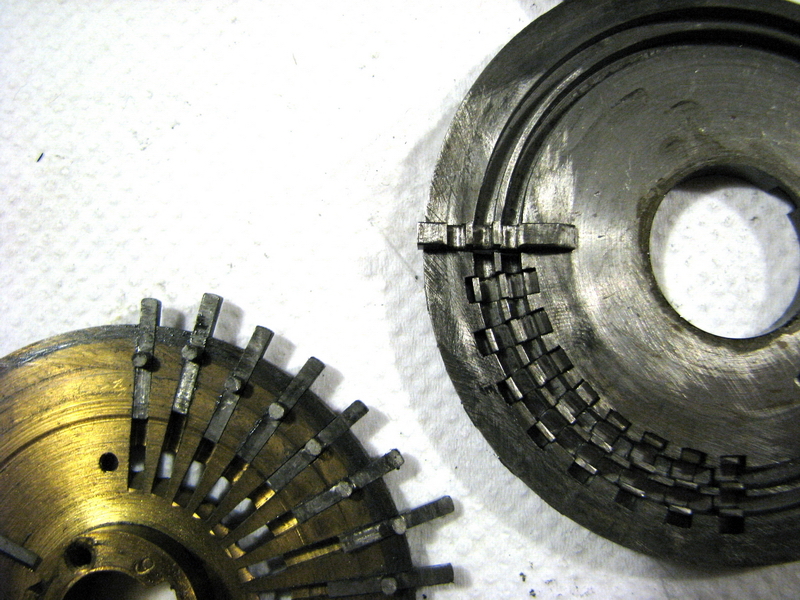 The final and most important difference is of course the pinwheel cylinder itself. 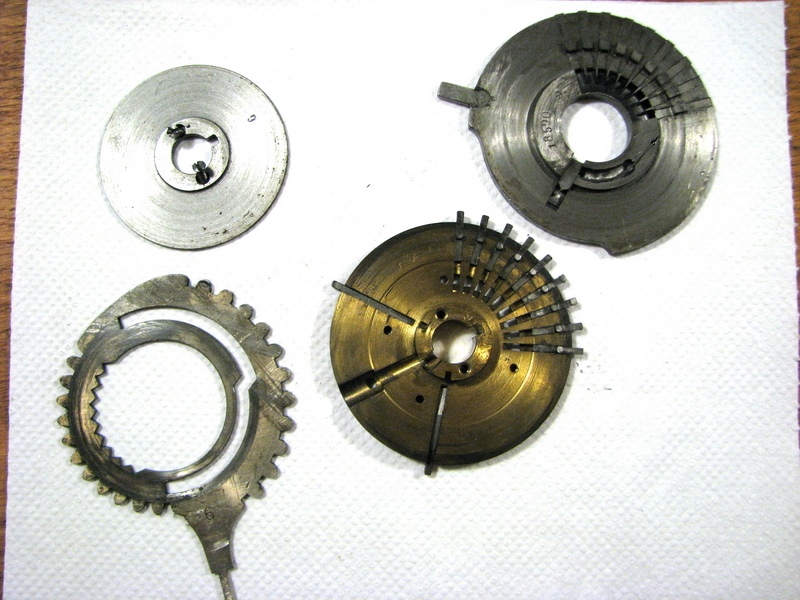 In addition to the previous article on the Brunsvige PJ, I now have some images of disassembled pinwheels of the Brunsviga K, allowing verification of the proposed principle of operation. 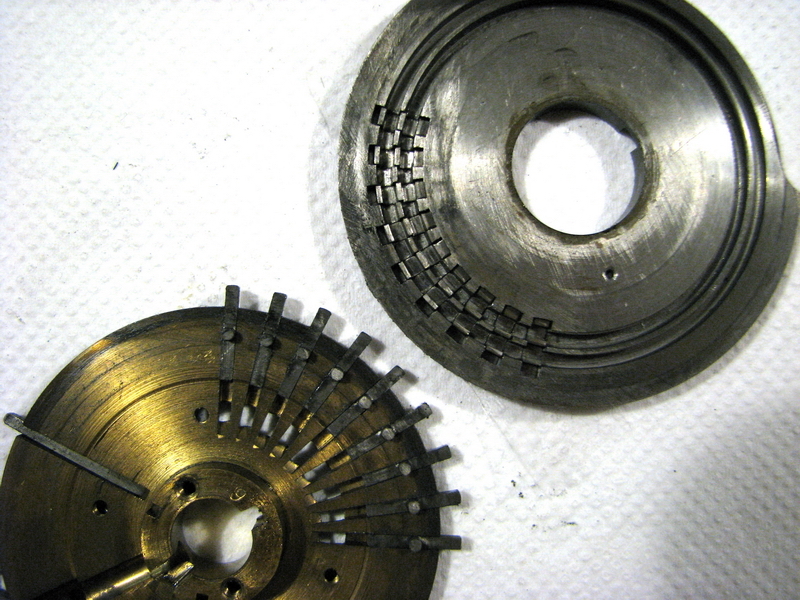 Every pinwheel in the Brunsviga K consists of four layers – rightmost is the brass pinwheel disk itself, which is keyed to the crank axle and always rotates with it. Then we have the cast iron intermediate pinwheel, which is sitting loose on a boss on the left side of the actual pinwheel. 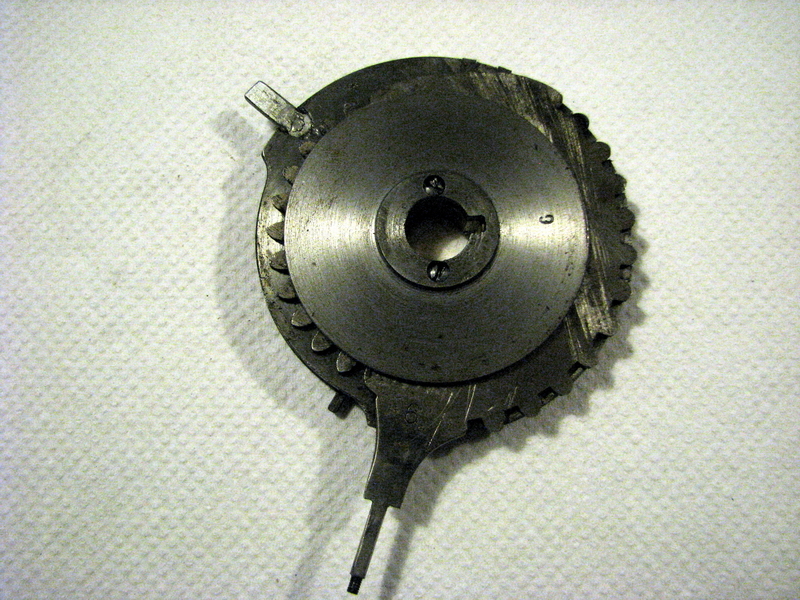 Then we have the steel setting lever disk, which is connected to the pins of the intermediate pinwheel, but again sitting loose on the crank. 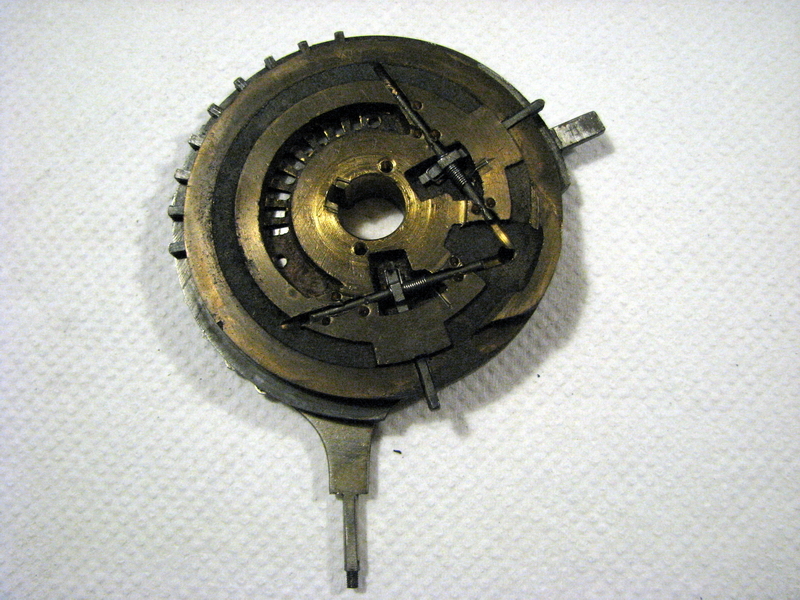 Finally, there is a cast iron locking disk, which prevents sideways movement of the setting disk and the intermediate pinwheel disk. All of these parts are clearly laid out in the following photographs. 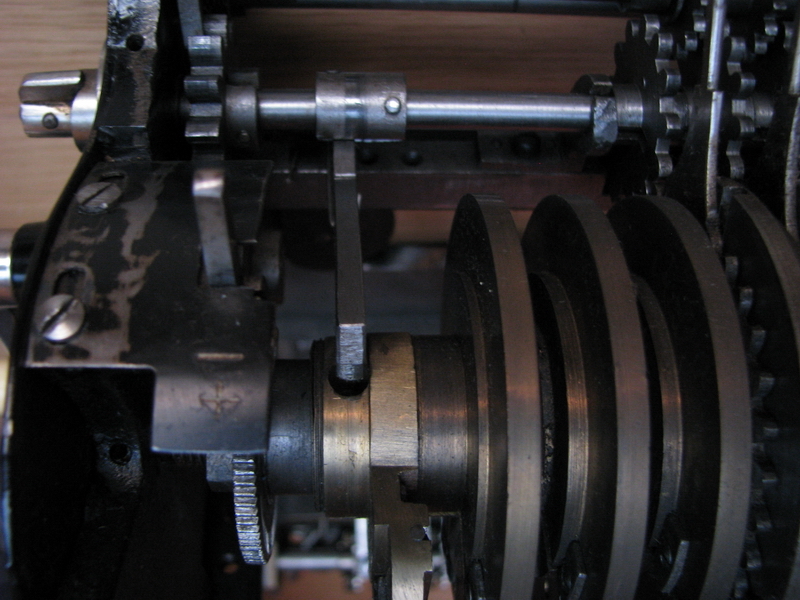 The key to the whole operation is that the cast iron intermediate disk is kept in a fixed position with respect to the rest of the machine by a long key which points into a slot screwed firmly to the base of the machine (key at 2 o'clock in the picture above). 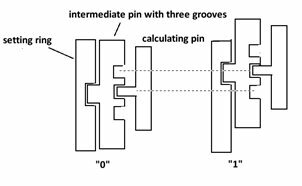 This means that every time the crank is in its resting position, every intermediate pin lines up exactly with its calculating pin, and the setting levers are free to be operated. 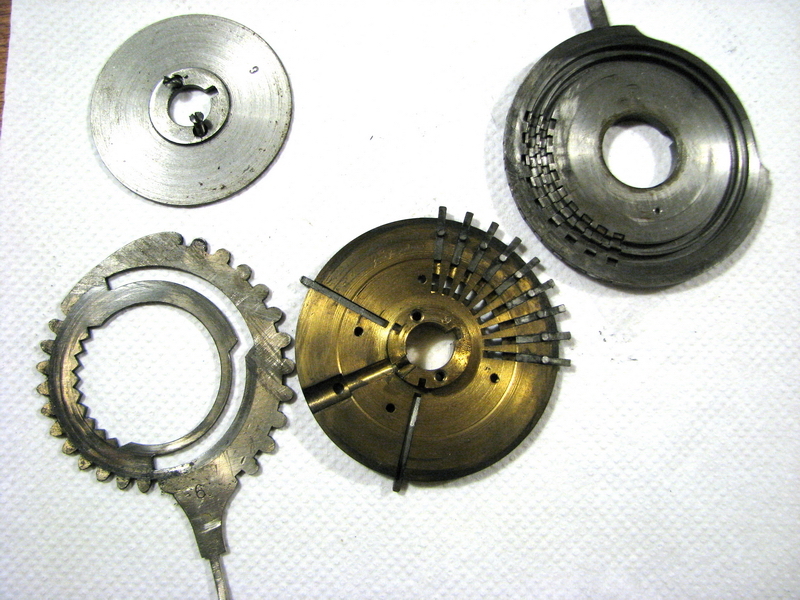 Four elements of the Brunsviga K pinwheel - parts in order top to bottom and left to right - intermediate disk in correct orientation in upper picture, and flipped over on the lower picture. 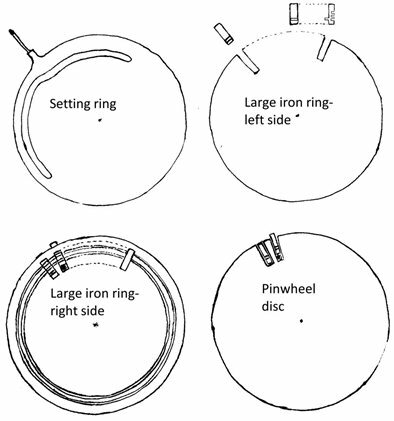 The locking of the setting register during rotation of the machine is taken care of inside the boss of the brass pinwheel disk mentioned higher – the sprung triangular pointer which takes care of the “tab” positions of the setting lever disc is not operated by a spiral spring from the bottom, but by a lateral wire spring. Rotating the setting lever pushes the base of this pointer down into a precisely machined slot in the boss of the brass pinwheel. 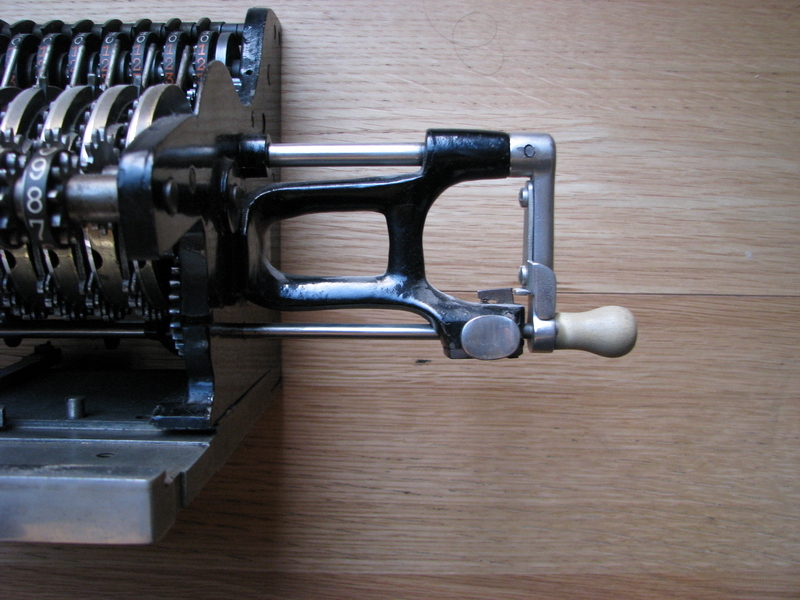 When the crank, together with the pinwheel, rotates away from its resting position, as in the picture below where the slot is at 8 o'clock and the pointer at 7 o'clock, the pointer no longer has any freedom to slide inwards, and the setting ring is effectively locked in place and can no longer be moved. of anyone with Brunsviga J, JA, MJ, MJR, MJI, MS or S machines, please take a careful look at the main crank handle, and to please be so kind to let me know if you find other machines without the thumb button, that could perhaps shed more light on these intriguing questions. Especially miniature machines with this feature missing would be extremely interesting. of anyone with a Brunsviga which clearly has “simplified construction” of some sort, dates to 1915-1916, and is another candidate for the Brunsviga K moniker, to please come out of the woodwork and let me know as well. of anyone with literature possibly pertaining to any of these machines, please contact me! If all my questions are suddenly answered, we might still be able to get to the bottom of this! In the mean time (March 2016), I have seen a picture of a Brunsviga N which also has this type of pinwheel cylinder (sadly, no serial number in the picture)- so now there are several Brunsviga J/K's with this cylinder, an unfinished or disassembled arithmotyp, and a Brunsviga N. No mention in the literature of a Brunsviga NK or KN, or an Arithmotyp SK or KS ...my theory is getting more and more improbable! Keep the machines coming! In August 2016, I received an excited email from Martin Reese, who had completely by accident, and looking for something entirely different, stumbled upon the patent for this exact mechanism. The patent is German patent nr. 291044, applied for on February 16, 1915 and published on March 31st 1916. The patent was applied for by Carl Rasmussen in Braunschweig, who was an employee of Grimme, Natalis & Co, but the firm is mentioned nowhere in the patent. In the patents applied for by him in the UK, his address is listed as Howald Strasse 5 in Braunschweig (not visited by Streetview yet ...), formerly (probably before he started working for GNC) Dreilindenstrasse 15 in Leipzig-Lindenau, and that building still exists. In the US, the patent lists him as being an engineer, and a subject of the king of Norway. In the french patents of 1914, the applicant is also Grimme, Natalis & Co, so it is clear that he was working for the firm at that time. In the period right before the Great War, he seems to have been occupied with the problem of long setting levers, tens' carry, and counter registers- another solution for long setting levers he patented (e.g. GB000191401909, as well as US000001108788) is a system with intermediate wheels between the pinwheel cylinder and the result register, to allow for much longer setting levers to pass. He also patented another solution which I am not sure has been applied - it seems very similar to what is inside a Brunsviga J, but those had been constructed (and patented) since 1908 - this is patent US00001199607. In any case, at least the pressing question about why the system was never patented is solved - it was, and we also know who the engineer was that developed the system. Finally, I would like to thank Dr. Jasmin Ramm-Ernst and Olaf Ernst, as well as Reinmar Wochinz and Horst and Heidi Borgmeyer, both for fruitful discussion, as well as for providing me with the data on the machines of this type in their collection, and relevant source material.